Currently showing at Tate Modern is Yayoi Kusama, the retrospective exhibition that celebrates the work of the Japanese artist who initially gained notoriety in 1960s New York with her avant-garde work. Although it was her pornographic 'Body Festivals' which made her infamous throughout the art world, it is her cerebral and psychedelic explorations into her own mental state which have placed her as one of the last centuries’ most significant post-modern artists. The Louis Vuitton Young Arts programme and REcreative website have teamed up with Tate with the ambition of finding new ways to engage young people with Kusama’s work and philosophy. These ambitions will culminate on 24th March, with ‘Infinite Kusama’, a day of interactive art, free for people aged 16-25. Highlights include fashion and sound workshops, including Kusama-inspired nail art by Boom Nails, and a UV silent disco, as well as an online competition to win a trip to Kusama’s studio in Tokyo. The centre piece of 'Infinite Kusama' is ‘The Hello Cube’, created by art duo Hellicar & Lewis, it will bring together the digital and physical worlds as an interactive art installation, embodying the signature aesthetic of Yayoi Kusama from her iconic work ‘The Passing Winter’. 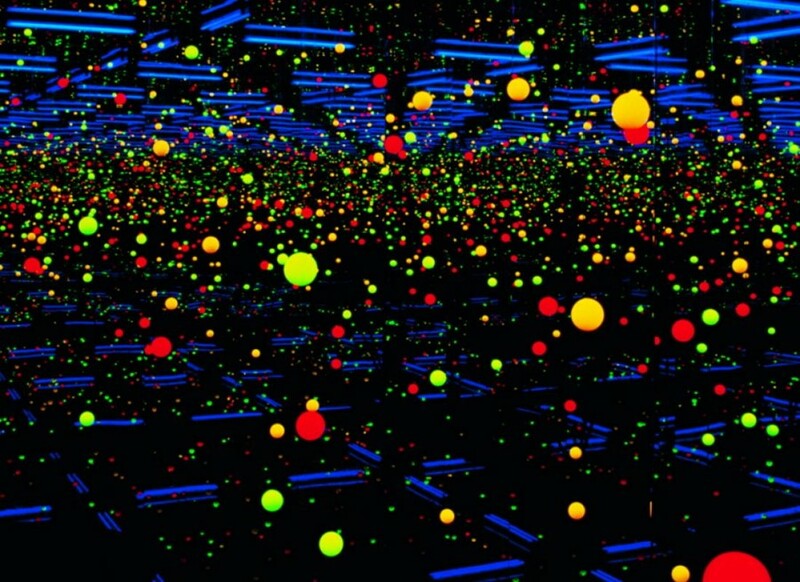 Dazed Digital: How did you decide what to create to contribute to Infinite Kusama? Hellicar & Lewis: We wanted to make a system that would exist in the real world and in this new social network world, a system that could create a feedback loop of interaction between the two. An internal and external beauty that could be shared. We hope that ‘The Hello Cube’ will bridge the ‘Infinite Kusama’ project to the wider Internet, and spur interest in Yayoi Kusama and her work. DD: Had you both previously been fans of her? H&L: We both loved her use of analogue optical techniques to make new spaces, we think we are both interested in patterns, systems and machines… human or otherwise. DD: Was it the similarities between your work that attracted you to the project? H&L: We were excited by the possibility to collaborate with the team at REcreative, to be inspired by Yayoi Kusama and the chance to exhibit in the Turbine Hall. DD: What made you choose ‘The Passing Winter’ as a specific starting point? H&L: We were intrigued by the visual illusion and the state in which people seemed to get when they looked inside. We’ve always been interested in mixing analogue and digital techniques, so it seemed like a natural progression. DD: So what exactly is ‘The Hello Cube’? H&L: ‘The Hello Cube’ is an installation that exists as a sculptural object that you can look inside, see patterns, and an infinity of reflections. DD: So quite similar to her work? H&L: Yes, but you can control the patterns; you can change the colour and other effects via Twitter. Once you’ve interacted with ‘The Hello Cube’, it then sends you a reply of the image of the interior of the mirror cube as how you requested. We hope that people will enjoy interacting with ‘The Hello Cube’, we can’t wait to see what people do with it!